Whenever you use Mass-Driver to break all subroutines on a piece of ice during a single encounter, the first 3 subroutines on the next piece of ice you encounter this run do not resolve. 2credit: Break code gate subroutine. 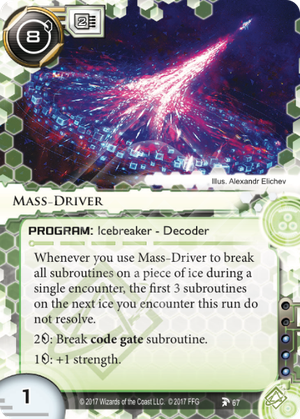 If the Runner breaks all the subroutines on a piece of ice with Mass-Driver, can they still break the subroutines on the next piece of ice that would not normally resolve? If the Runner breaks all the subroutines on a piece of ice with Mass-Driver, then breaks one of the first three subroutines on the next ice encountered, does the fourth subroutine on that ice resolve or not? Only the first three subroutines on the next piece of ice are ever ignored. If the Runner breaks any of those subroutines, then the effect of Mass-Driver does not pass on to the next subroutine. A big, powerful and expensive breaker that works best if you look at ice through a shaper lens. Shapers have cards like Escher and Inversificator to alter the layout of servers. With them you could arrange a heavy piece of ice to be behind an easily broken code gate (or something Egret made into a code gate). That does suppose however that there's heavy nasty ice that justifies the high cost of Mass-Driver. In the current meta that's far from guaranteed. And since Mass-Driver and its support cards pretty much require a deck to be built around them that's rather a big problem. Maybe I'm just being grumpy but I don't really see a way to make Mass-Driver reliable enough to be worth the high cost. Lets see, this Mass-Driver takes up twice the memory of 2 typical breakers, is twice as expensive to install as 2 typical breakers, and breaks subroutines half as efficiently as a typical breaker. So what do you gain? Almost certainly you will still need all types of breakers in your deck, so you do not save slots. Actually this card probably eats up extra slots because you will be tempted to cheat it out. You are including this card solely for its special ability, but I guess we probably knew that going in. Unfortunately, this card is so inefficient that you are better off just breaking the next ice normally. Furthermore, unless you are Kit, you are counting on the corp to position their ice a certain way. Good luck with that. Finally, there is no guarantee that the ice behind the piece you break has less than four subroutines.